Springerle Cookies have been and still are traditional Christmas cookies in Bavaria and Austria for centuries that date back to at least the 1600s. Springerle are white, anise-flavored cookies, made from a simple egg-flour-sugar dough. Usually rectangular or circular in shape, they have a picture or design stamped on the top. The images are imprinted with specially carved Springerle Rolling Pins or flat molds (Springerle presses or boards). After the cookies are baked, the designs are sometimes enhanced with edible food colors, tempera, or acrylic paints if the cookies are to be used as decorations. The name Springerle (SPRING-uhr-lee) comes from an old German dialect and means “little knight” or “jumping horse.” Historians trace these cookies back to the Julfest, a midwinter celebration of pagan Germanic tribes. Julfest ceremonies included the sacrificing of animals to the gods, in hope that such offerings would bring a mild winter and an early spring. Poor people who could not afford to kill any of their animals gave token sacrifices in the form of animal-shaped breads and cookies. Vestiges of these pagan practices survive in the baking of shaped-and-stamped German Christmas cookies such as Lebkuchen, Spekulatius, Frankfurter Brenten, and Springerle. Scenes from the Bible were some of the earliest images portrayed on the springerle molds. and were used to educate those who couldn’t read or write. Eventually, other scenes were carved and the cookies soon reflected images of holidays, events, and scenes from every day life. The cookies were also used to celebrate births, weddings, and used as betrothal tokens. Exchanging springerle cookies during the holidays was a common practice very much like we exchange cards today. This is a family recipe for Springerle Cookies that was shared with me by Ann Pratt of Aloha, Oregon. Ann says that this is the Schachner family recipe. In a large mixing bowl, beat eggs on high speed of your electric mixer until light and fluffy. Add sugar, butter, and baking powder; beat at high speed for 15 minutes, scraping sides of bowl occasionally. Beat in anise oil or extract. Gradually beat in flour until well mixed. Lightly flour your springerle rolling pin (see photo below); set aside. On a lightly floured board, knead the dough a few time (the dough will be sticky at first, so knead in just enough flour to make it manageable). You want the dough just firm enough not to stick in the mold. On large molds or very intricate molds, also lighty dust them with flour. Use your pastry brush to get the excess flour from the details in the mold. This helps get a clearer image. Using a standard Rolling Pin, roll into a rectangle about 1/2-inch thick (be carful not to roll the dough too thin). Using your floured Springerle Rolling Pin, roll slowly and firmly over the previously rolled dough to make a clear design. Using a sharp knife, cut cookies apart and trim off outside edges. Place cookies on your prepared cookie sheets. Place cookies on your prepared cookie sheets. Let cookies stand, uncovered, at least 12 hours to dry. Sometimes they may need to dry as long as 36 hours before baking. NOTE: Drying preserves the image during baking. Bake one (1) baking sheet at a time only. Bake approximately 10 minutes until slightly golden on bottoms, but white on top. NOTE: Be observant while baking your Springerie. If they puff up too much, gently push the bubble down. Rotate the pan front to back top to bottom once while baking. Remove from oven and transfer cookies to wire cooling rack to cool (let cookies stand overnight to completely dry before storing). The longer Springerle sit the harder they become. Right out of the oven they are crunchy on the outside but soft and tender on the inside. Thank You!!! I have a recipe that was handed down from my German Grandmother but with little direction. This was the perfect bridge to being able to honor her recipe and have clearer instructions. One thing she did was to sprinkle anise seed on the baking tray and then place the unbaked dough on top of that while drying and baking. And now I understand why it dries. This was helpful. Danke. The recipe I have calls for MUCH less sugar, and it also calls for the cookies, once rolled and cut apart, to sit over night to dry. Instead of putting anise oil in the cookies, the parchment is sprinkled with anise seed and the cut cookies placed on top. Yes, they are supposed to be hard, sort of a German biscotti. Please share your recipe. I like things with less sugar. If you want to preserve the softness, keep in an airtight container and place a piece of white bread on a paper towel on top of the cookies. I would like to find out how I can order the Springerle rolling pen. Try searching in a gourmet kitchen appliance store like Willams Sonoma or you can also order online through Amazon. I found all of my springerle rolling pins at antique malls and flea markets. Most people don’t know what they are, so they sell pretty cheap. I used to have my grandmothers . It has been lost. Have made these cookies every Christmas. This is my 46th year. My late husband taught me. Seeds on baking sheet. Yes, let rest over night to keep imprint. Will try this recipe for fun. I’ve never tried it on sugar cookie dough, but you could try the same principal. Roll the springerle rolling pin over the dough for the markings, cut the shapes and then let the dough dry overnight before baking to see if the design stays in the dough. My grandma was the same with recipes. Included with her recipe cards, I have about 25 strips of paper, store receipts, envelopes, with just ingredient lists, no directions. I also had this weird rolling pin. From my experience of both recopies, I do that this will NOT work on sugar cookie dough. That dough has too much leavening will raise too much and distort the design. . Springerle depend on the air whipped in i the eggs, and not on other agents While the cookies usually have some leavening agent, they are close to a meringue . 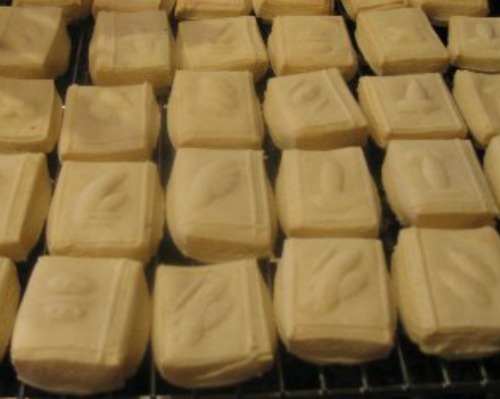 Sugar cookie dough has a much higher ratio of fat to flour and sugar to the number of eggs, and would suffer greatly from being beaten and such high speed. Springerle molds have much fine definition that I do not think would transfer well to such a heavy dough. This is great feedback on the Sugar cookie dough. Thank you! My dough is too dry. The first time i made this recipe, it was not. Can i fix this or do I need to start over? Thank you. It is a great recipe. I suspect egg sizing standards have changed in the past century — if I make the family recipe with the large eggs called for, the dough is usually too moist. If the dough is still mixable, you could add a tiny amount of water or maybe beaten egg to the mix and see what happens. The line between “dry” and “just right” is a fine one. None of the recipes I see here call for it, but the Brugger-Brucker-Willenborg-Steinebrunner consensus is that you put the springerle roller in the refrigerator a day ahead of baking to help it keep from sticking. Neither Gma made these, but my maternal grandmother had 21 kids, & no countertops… She did make an anise cookie dough, & cut them in triangles, & did an egg white wash before baking… Every thing had to be simple ingredients, and quick to make quantities. I will be substituting hartshorn for the baking powder. (King Arthur flour says 1/2t hartshorn for 1t bp. Elsewhere it says 1 to 1 ration. Any ideas? I can’t find my mother’s recipes. Do I need to dissolve the hartshorn in a liquid before adding it? Thanks for any help! Hartshorn is ammonia based isn’t it? Is that safe? I am so happy to find the recipe and directions for these! This was my dad’s Christmas tradition when I was growing up. He’s not able to make them anymore due to age. Now I will be able to carry the tradition on! My mama’s family is German and Springerle is the Christmas tradition passed down. My Aunt Esther made dozens every year. No one could make them as good as hers. She would only make them when the weather was just right (dry and cold) and the cookies needed to dry overnight in the attic. The cookies were soft on Christmas morning, but you kept them in tins for weeks and when they were hard they were dunked in coffee or cocoa. As a child I never really liked the springele cookies – not sweet enough, anise flavor, too dry and hard. But they remind me of my family traditions, and dear departed, so now I love them. I saw this cookie on another website with the rolling pin. I have one of these rolling pins and I use to make these cookies. My mother gave me the rolling pin over 54 years ago, therefore it is an antique like me. So glad I found a recipe to use my little rolling pin. I can’t wait to make these again. My father came from Sweden, so I guess maybe my grandmother gave my mother the rolling pin. No one is alive anymore for me to find out. We use to have the at Christmas time and my rolling pin has bird heads, wheat, flowers, etc on it. The rolling pin itself doesn’t spin like a regular rolling pin, so I guess you just have to push it to roll it out. Does anyone know about this not spinning? My grandmother used to make these every Christmas, I’ve always looked forward to these. But as far as I can remember my grandmother’s springerle’s had a licorice flavor and they were white. It’s been so long ago – and I don’t know anyone else that makes them. It’s sad that no one in the family got her recipe. I’ve always wanted to make them but I’m afraid I won’t find the right recipe and they won’t be like my grandmother’s. You should try it out and see what you think. Some recipes use anise seed for licorice flavor and some use anise extract. You can also soften them by adding a cut apple to them in an airtight container for a few days before eating. Never knew about the bread!